SiteGround is one of the most celebrated web hosting providers in recent years. They are a company with about 400 employees which has gained the trust of owners of around 2 million domains. Day by day, the love for SiteGround has been increasing. From Sofia, Bulgaria, SiteGround has come a long way. They are now recognized internationally. If you are looking for opening a website then you can give them a try. This post is an especial one for our readers who are student and beginner in the web hosting game. 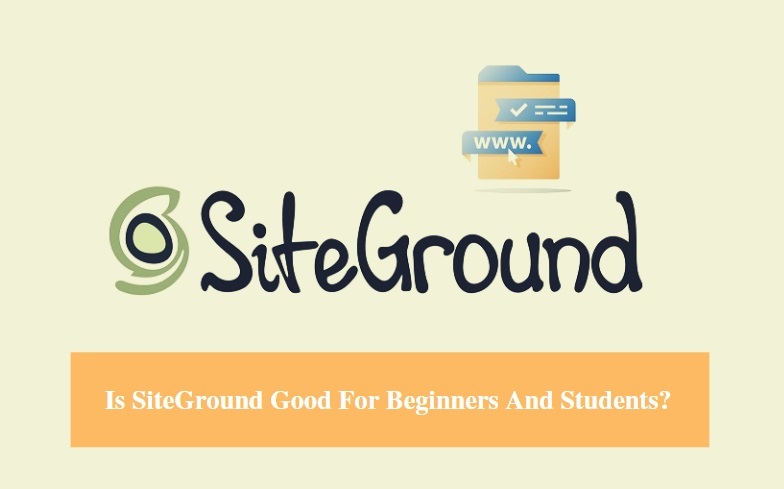 We will let you know if SiteGround is good for beginners and students. So, if you are one of them, you are welcome to read this post. Is SiteGround Good For Beginners And Students? Why SiteGround is perfect for beginners? In a few words, we can say that SiteGround is the best web hosting company out there for the beginners. There are a number of reasons behind our claim. And, we will let you know some of these in this section. SiteGround is offering ‘Managed’ web hosting on almost all of their web hosting plans. If you are a beginner then you should get the ‘Managed’ web hosting. This means all of the advanced and technical activities will be taken care of by the SiteGround professional teams. You don’t need to do anything to manage your web hosting account. Rather, you will have the time to focus on creating awesome contents for your websites. They provide a beginner-friendly website builder with each of the web hosting account. With the help of this, you can build a new website without having any prior experience related to website building. 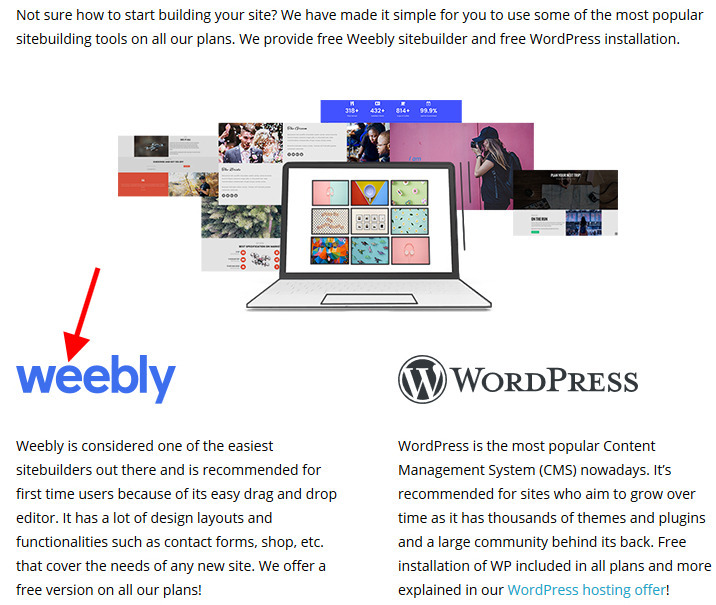 They have partnered with ‘Weebly’; which is known as one of the most intuitive website builders out there. You will get a free version of this great website builder with your account. So, there’s no need to worry if you are new to this. If you can use your mouse to drag and drop, you are already there. Another great news for the beginners, SiteGround has teamed up with Softaculous; which is an auto installer software. You will need a platform to run your website on. 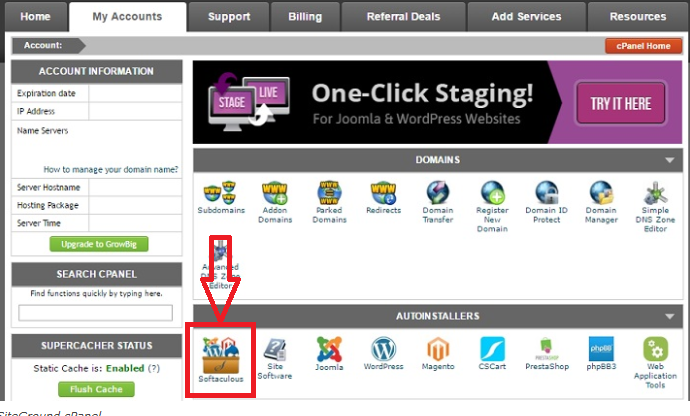 For instance, you can use CMSs like WordPress, Joomla, Drupal, MyBB etc. on your website. And, with the help of the Softaculous auto installer, you can install any of these softwares with just a few clicks of your mouse. SiteGround state this feature as the ‘One-Click Installation’. Whenever you would enter into the user area of your web hosting account, you will be greeted with an intuitive setup wizard. This setup wizard will tell you what to do, how to do, and why to do those. So, you can set up your hosting account without any issues and in the process, you will most likely learn the method as well. So, what happens when you are stuck with a problem regarding your web hosting account? No need to worry. If you are stuck then you can get help from the official web page of SiteGround. 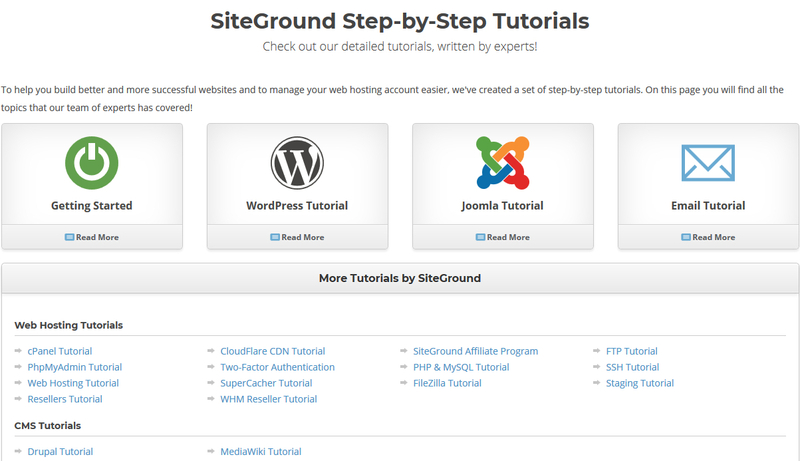 Siteground has a huge collection of web hosting related tutorials. All of these tutorials are written and explained in a step by step manner. So, it will be very easy to understand them even if you are a beginner. All of the tutorials are also nicely categorized so that anyone can find them within an instant. On top of all these, they are also offering a ‘Knowledge Base’ on their website. You will find about 1100 articles in more than 37 categories on that page. All of the FAQs are also covered in that knowledge base page. So, whatever the problem you are facing, you will certainly find a solution in there. You can easily use the search bar on that page to find the solution to your problem as soon as possible. They also have a lot of tutorial videos on their official YouTube channel. All of these tutorials and videos are free for everybody. Even if you are not an active customer of SiteGround you are free to learn from these tutorials. So, you have faced a problem which you cannot solve even after searching for the solution on the official knowledge base and tutorial page of SiteGround. There’s still hope for you. And, that is the time when the awesome customer support staffs of SiteGround comes into play. They are offering 24/7 customer support via multiple mediums such as Email, phones, live chat, fax, tickets etc. If you want a fast response then go for the live chat option. We always use the live chat option as well. And, we can tell you that you will get a response form SiteGround within a minute or two using this method. All of their customer support staffs are professional and most importantly, they are patient with their customers. So, if you are a beginner, there will be no problem. They will help you until your issue is solved completely. We have liked their customer service. You can try to get in touch with them to check it for yourself. It is open to everybody. Now that you know some of the reasons for recommending SiteGround to beginner website owners. At this point, we will talk about if SiteGround is good for students or not. Why SiteGround is perfect for Students? If you are a student then SiteGround can be a great choice for you. Let’s see why SiteGround is great for students. If you are a student who has a valid email address at a .edu domain name, you can get this unbelievable offer. That means you will be getting all of the features of the StartUp plan just for $1.99 per month. Whereas the regular price of this plan is $3.95/month. With this plan, you are allowed to host only one website which is perfect for about 10,000 monthly visitors. This is actually enough for a student who is looking to open a blog, or showcase their work, or upload their resume, or even open any other big websites as well. 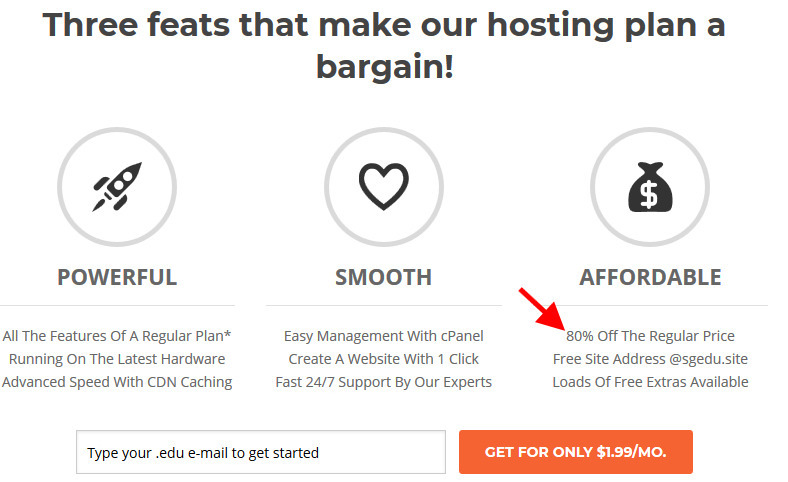 With all these, you will also get a lot of other free features which are exclusive to the student web hosting plan only. If that’s the case for you, you shouldn’t worry at all. Because, even without the special discount, the prices of the web hosting plans of SiteGround are very affordable. So, you can choose one which is perfect for your needs. If you get one of these advanced web hosting plans such as the GrowBig or the GoGeek plan, you will receive lots of additional features. Those can come in handy if you have one or multiple big websites. Some of those features are git integration, staging, dynamic caching, domain management, website migration, CDN, SSD hosting, SpamExperts etc. Whether you are a student or not, you should always choose a hosting provider which is secure and have the industry standard uptime. If you don’t know it yet, the industry standard uptime is 99%+. If the web hosting company you are using don’t maintain this type of uptime, then you should avoid them. 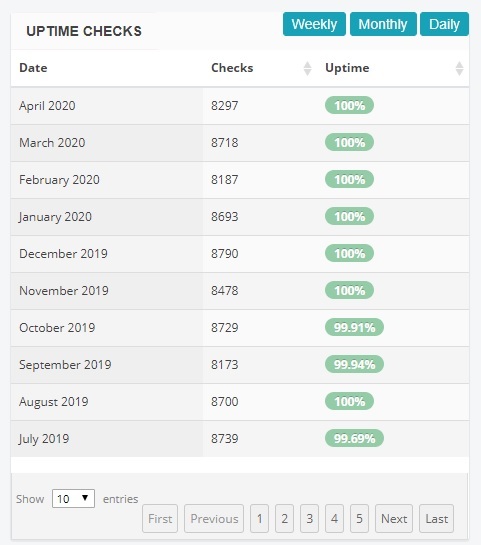 Luckily, SiteGround maintains the industry standard uptime. You can find the uptime stat of our website (ReviewPlan.com) which is hosted on SiteGround down below. This clearly shows that you can rely on SiteGround. The next important thing is the security of your websites. If the web hosting company is not secure enough then it is inevitable that your site might get attacked. To avoid this type of situations, SiteGround has taken proper steps. They are offering free SSL with every domain names. Added to that, SiteGround also has a 3 level security set up on their servers which is very powerful. And, they update and tweak all of their security rules on a regular basis. Moreover, SiteGround also writes their own firewall rules (custom) themselves and they tweak it weekly. So that it cannot be interpreted by the hackers. Before we go, we have to tell you that, SiteGround is the best option as a web hosting provider. They have lots of features and awesome affordable web hosting plans as well. You are bound to find one or more web hosting plans which are perfect for your needs. So, whether you are a student or a beginner who have no idea about web hosting, you can choose SiteGround without a doubt. SiteGround also provides best security, friendly and fast customer support, industry standard uptime, and ultra-fast web servers etc. These are the things which are very rare in the web hosting industry. So, we would definitely recommend SiteGround for our beginner and student readers.